Home > Extreme Couponing 101 > SuperCenter or Grocery Store? 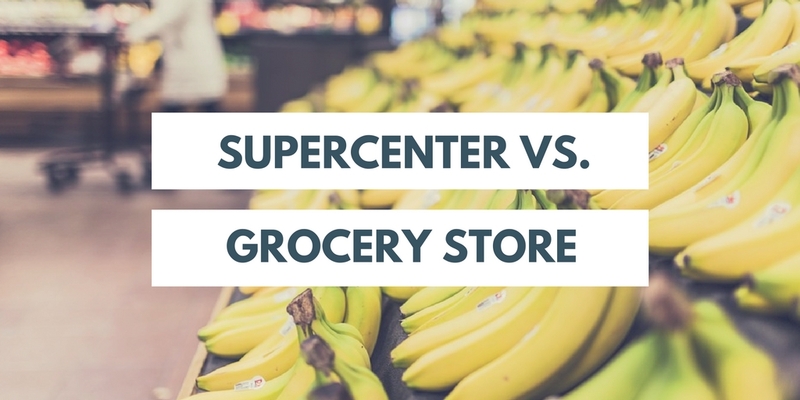 If you have been around Southern Savers for a while or attended a workshop, you know how I feel about supercenters: they can never compete with local grocery stores. However, I have noticed that many people still seem to think that shopping at supercenters is the way to go. In an attempt to prove to you that you will save more money at grocery stores, I did a little test this past week. I took all of the on-sale items at Publix and Kroger and went into my local supercenter to look at how their prices matched up. To put it simply, they didn’t. It may seem to be slightly biased to select only the on-sale items and compare but my particular local supercenter (and I suspect yours does as well) advertises “Always Low Prices”. In other words, their prices are always as low as they will get and they will not run a lower sale. Also, as you know, I only buy on-sale items. This again was pretending to only buy 1 of each item, and using Southern Savers we want to stock up for 6 weeks, which would only make the amount saved greater. To put these numbers in perspective, let’s say that you went to Publix and purchased only one of the on-sale items for a month (4 weeks) instead of the supercenter. You would save over $240 a month! I hope this is convincing and shows you how much money you could be saving. I know that the supercenters are convenient and it can be easy to shop there. But if you really want to save money, the grocery stores are really the way to go. Buy one get one deals are normally sold at the top retail price, but this shows that getting 50% off the top price is a considerable savings over the “everyday low price” at the supercenter. If you still aren’t convinced, let me know what you would like to see compared next! **Publix numbers did not include any competitor coupons since each area is allowed different coupons.